Thermaldry anti-condensation coating is an acrylic water based Emulsion paint incorporating small hollow glass beads. The micro glass beads work like small thermos flasks , blocking thermal energy by reflecting it away from the walls , protecting the walls from damp and condensation which can cause s moisture and mould growth. Thermaldry increases the wall temperature reducing the dew point , the temperature which condensation occurs. Thermaldry is a two coat system which should be applied as one coat horizontal followed by one coat applied vertically. Drying time between coats 2-4 hours , with a minimum application temperature of 5 degrees C and a maximum application temperature of 30 degrees C.
The paint should be stirred gently so as not to damage the micro beads. DO NOT USE A MECHANICAL STIRRER. 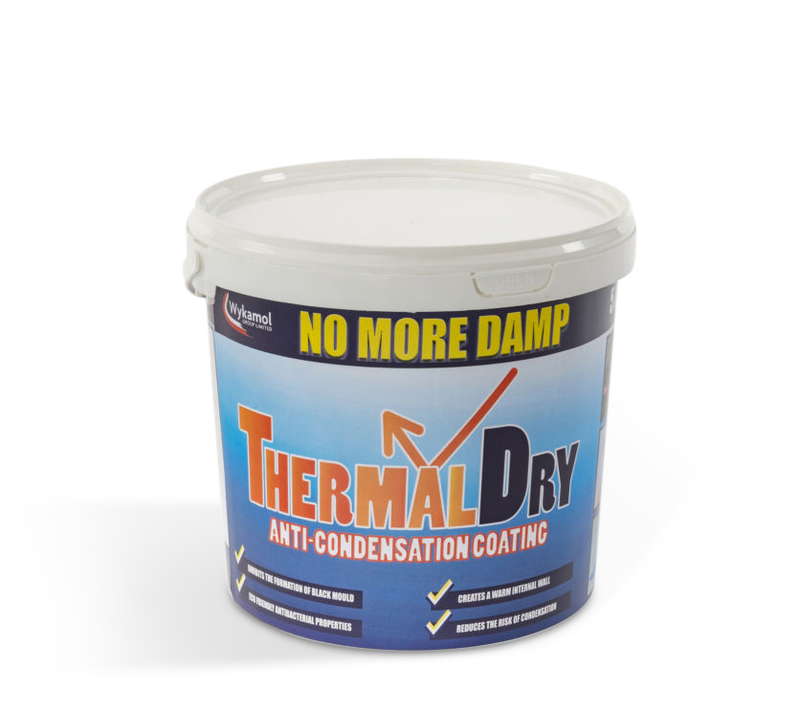 Thermal dry can be applied over existing paint, plaster , brick and concrete. Bathrooms, Utility rooms, Kitchens and cold external walls. When dry the coating is waterproof and warm to the touch. Reduces the risk of condensation. Reduces thermal conductivity saving energy and fuel costs in your home. Coverage 4-5 m2/Litre /per coat. Available in 2.5 and 5 litre containers.